Monsooned Malabar coffee takes its name from India's southwest, or Malabar Coast, where it is prepared during the monsoon months of June through September. The Monsooned Malabar is an unwashed coffee with a smooth and mellow flavour, and definite spicy overtones. It has a unique taste unlike any other coffee in the world. 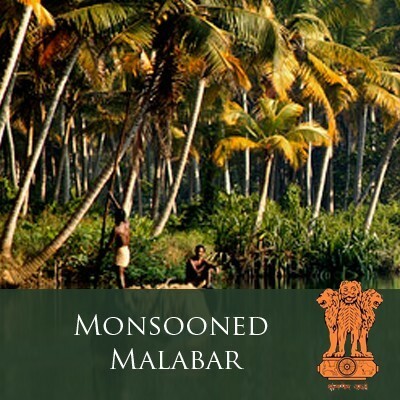 The most noteworthy characteristic of a Monsooned Malabar is its mellow cup, a direct result of the monsooning which occurs on the Malabar Coast. When the coffee comes down from the mountains to the coast, it is taken to warehouses where it is spread out and turned regularly so that the beans can absorb moisture during the monsoon months of June through September. The process yellows the coffee beans and causes them to swell in size, reducing the acidity. The result is a smooth, mellow cup with intriguing hints of spice.